NEW YORK (AP) -- The Twitter accounts for two national CBS programs have been compromised and suspended. A CBS News spokeswoman confirms Saturday that tweets sent earlier in the afternoon from the "60 Minutes" and "48 Hours" Twitter handles saying their accounts were compromised are correct. The tweets said the network is working with Twitter to investigate. On Saturday night both accounts were suspended and inaccessible. Twitter did not immediately respond to a request for comment. The CBS spokeswoman didn't comment further. 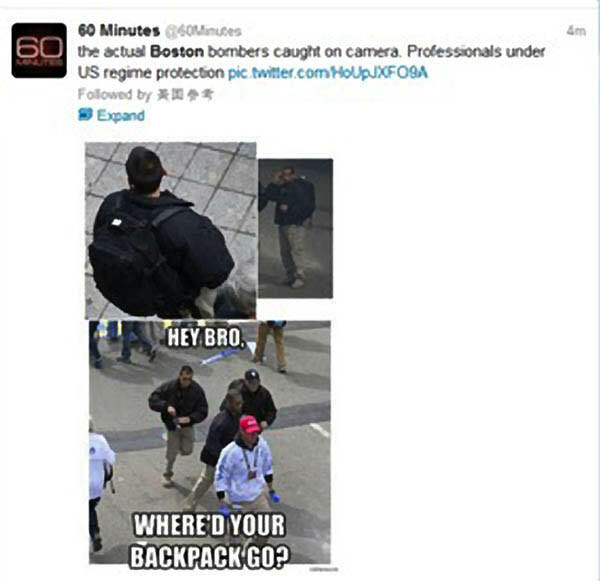 Earlier in the day tweets coming from the 60 Minutes account seemed farfetched, including one that claimed the US government was "hiding the real culprit of the Boston bombing."